This comic is created thanks to support from patrons. Want cool pinups and more comics? Join our Patreon today! 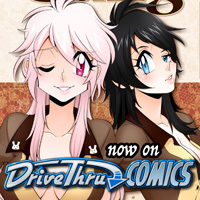 Buy MG on DriveThru and finance new pages! Hey, folks. Just a quick note to let everyone know: Mocaccino Gang isn’t dead, but in order to keep it going, we may have to resort to some unusual practices. Over the next few months, I will try and find time with Prettío to complete chapter 2 so we can compile the first two into comic books that will be purchasable via Drivethru Comics. Ideally, we are trying to sell enough copies of the books (both print and digital) to justify commissioning a new chapter. This may be one of the greatest challenges we’ve ever faced, as we all know that the royalties on print are not spectacular. But, we’re going to try it anyway, and you get print-quality versions of your favorite webcomic-in-training for your part of the deal. Watch this space for the remaining updates and further news regarding the sale.